There are a few things you can count on around the holidays – lots of food, family and friends, and special music events. The Twin Cities has spawned more than its share of fine jazz musicians, which means we often have a chance to see them live around the holidays when they return to visit family. 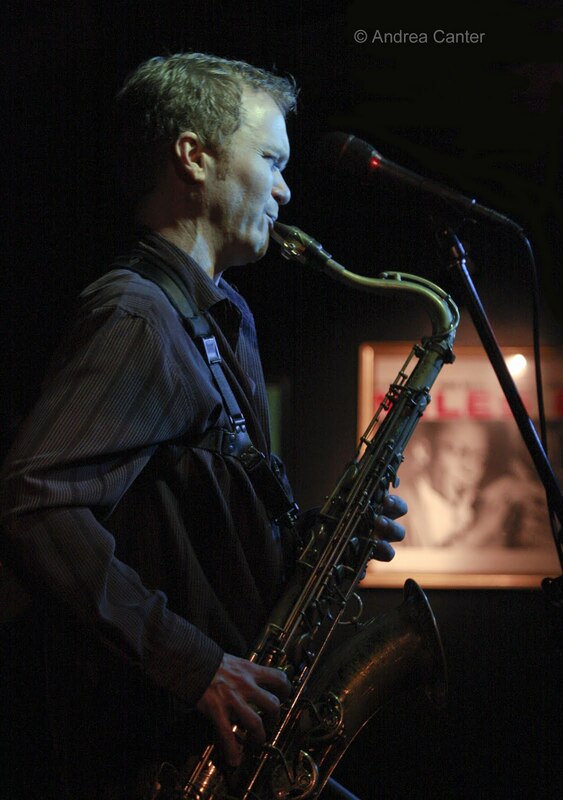 This weekend, we have the pleasure of enjoying saxophonist Pat Mallinger at the Artists Quarter. Home for much of the week to visit family in St. Paul, the Chicago resident warmed up Wednesday night and promises that the heat will only accelerate through Saturday night. Based on that preview, it’s hard to imagine a better way to burn off the mashed potatoes and pumpkin pie than by swinging and swaying to Pat’s Twin Cities quartet with Chris Lomheim, Graydon Peterson and Kenny Horst. Soaring on alto through covers of Devil May Care and Poor Butterfly and his own “Hills of Tuscany,” Pat took up the tenor for “Dedicated to You” and Dexter Gordon’s “Fried Bananas.” Lomheim made the most of the new hammers on the AQ’s Yamaha. There’s two more nights of this Bop City titan (11/27-28). Keyboard fire will be on the menu at the Dakota this weekend as Nachito Herrera cooks up some Havana treats (11/27-28), while Saturday’s Late Night sets cross the globe to Eastern Europe and the elegant interpretations of guitarist Tim Sparks, in trio with Chris Bates and Jay Epstein (11/28). One of the newer venues for music, the Red Stag Supper Club in Minneapolis features inventive pianist/composer Jeremy Walker and his Small City Trio (11/29). And there’s beautiful songs in the air – with Charmin Michelle at Crave in the Galleria (Friday) and Crave in St. Louis Park (Sunday brunch); Maud Hixson and Rick Carlson at the Downtowner Woodfire in St. Paul (Friday) and at the Ingredients Café in White Bear (Saturday). For more avant garde tastes, you’ll find Peter Schimke and Jim Anton trying out some new music at Café Maude (11/27) and Milo Fine releasing a new LP (!) at Rouge Buddha Gallery (11/28). A highlight of the week for fans of vocal music will be the return of Jane Monheit to the Dakota (11/30-12/1). No longer qualifying as a starlet at 32 (and a new mom! 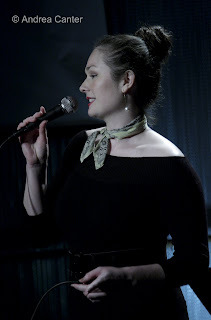 ), Monheit continues to prove that a buttercream instrument can mesh equally well with the Great American Songbook and the Global Popbook, as her most recent recordings document. Each outing, she seems to go just a bit further in personalizing timeless songs, making her appealing to just about any listener who favors a beautiful voice. 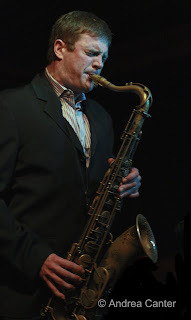 Regular jazz nights abound through the week, with JoAnn Funk and Jeff Bruekse at the St Paul Hotel Lobby Bar (Fridays and Saturdays); Benny Weinbeck Trio at D’Amico’s in the Chambers Hotel, downtown Minneapolis (Fridays and Saturdays); “Mr. Smooth” Irv Williams at Il Vesco Vino in St Paul (Saturdays); the Zacc Harris Trio at Riverview Wine Bar in south Minneapolis (Sundays); Charmin Michelle and Denny Malmberg at Fireside Pizza (Mondays and Wednesdays); the Cory Wong Quartet followed by the Tuesday Night Band at the AQ (Tuesdays); Debbie Duncan and Mary Louise Knutson at Camp Bar in downtown St. Paul (Tuesdays); Nancy Harms with the Hot Swing Trio this month at Erte in northeast Minneapolis (Wednesdays); the swinging Wolverines Trio at Hell’s Kitchen (Wednesdays), this week with Tanner Taylor on keys and the fabulously sassy Nichola Miller on vocals. Coming Soon! Next weekend features the annual Dakota Jazz Club performance of the Dakota Combo, now directed by Adam Linz and featuring the best high school jazzers in the metro area and beyond. They will perform Saturday (12/5) with hot young saxophonist Tia Fuller. 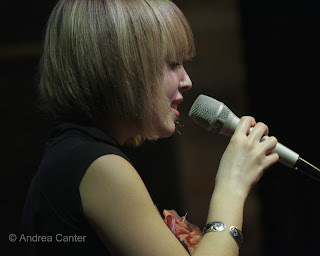 Mark you calendars ahead for Laura Caviani’s annual holiday gig, this year at the AQ (12/13); the newly formed "530" band of area college musicians home for the holidays (Chris Misa, Cory Grindberg, Rob Fletcher, Jake Baldwin and guests) doing an early set at the AQ (12/17); CD release from the Atlantis Quartet at the AQ (12/18-19); the Twin Cities Jazz Society’s 60th birthday salute to Birdland with Bruce Henry, Debbie Duncan and Lee Engele at the Bloomington Performing Arts Center (12/20); the annual residency of The Bad Plus at the Dakota (12/25-27); and great New Year’s Eve parties all over town, particularly note the Dakota and AQ for tops in jazz. Photos: (Top to bottom) Pat Mallinger at the AQ on 11/25; Tim Sparks at his Dakota Late Night debut in July; Jane Monheit (press photo). Photos of Mallinger and Sparks by Andrea Canter. 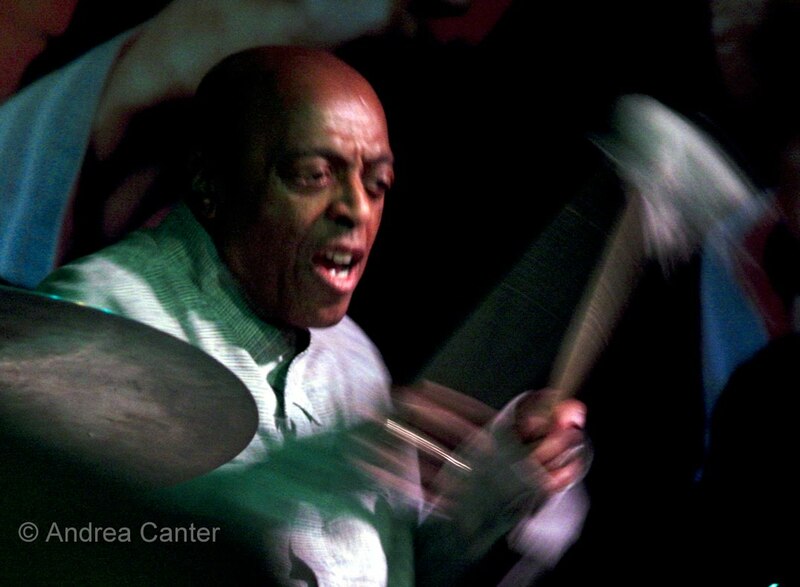 Every two or three years, at least in this decade, living jazz legend Roy Haynes spends a weekend in St. Paul at the Artists’ Quarter with his pal Kenny Horst. It’s one of the few times you will not see Kenny playing drums with a visiting artist, but you can count on Kenny to do something else unusual—introducing the band. It’s a role usually reserved for the suave Davis Wilson, the one who always welcomes “my lords and ladies” and notes that the AQ is “pleased and flipped” to bring the music to the audience. But not when Roy Haynes is on the schedule. 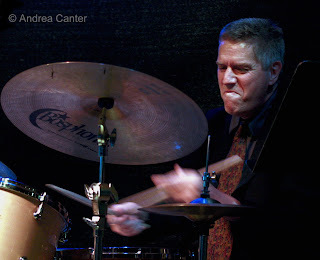 Drummer Kenny Horst regards drummer Roy Haynes as a mentor. In fact that set of green metallic drums that is usually on the AQ stage was a gift from Roy. When Roy comes to town, Kenny handles the host chores with a big grin on his face. He’s in Haynes Heaven. And so are we. 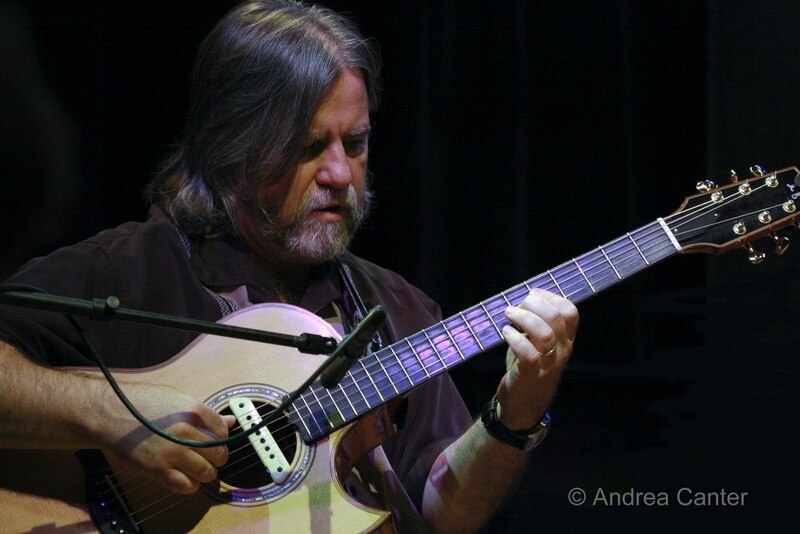 This past weekend, Roy returned for the first time since recording a live album (Where As) for Dreyfus, a “snap crackle” effort that brought an instrumental solo Grammy nomination to Haynes for his impromptu “Hippidy Hop.” This time, the band was his original Fountain of Youth, first seen here in 2004 with Martin Bejerano on piano, John Sullivan on bass, and Marcus Strickland on sax. 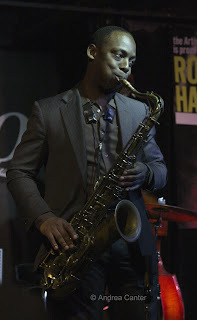 Only Sullivan made the recording date in 2006, with Bejerano getting a rain check due to a schedule conflict, and Jaleel Shaw having assumed the horn chair with Strickland finding less and less time available as his own band gained recognition. Another whopping young talent, Robert Rodriguez, admirably held his own on keys. For a while, Sullivan dropped out of the band to pursue real estate and other projects. When we last saw Roy Haynes in the Twin Cities—at Ted Mann and at the Dakota, he had another fine young bassist, David Wong, along with Bejerano and Shaw. Smartly, Roy always surrounds himself with the best of the young rising stars. They benefit from his experience; he benefits from their energy. 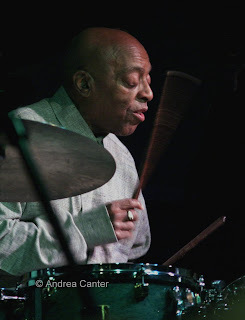 The Academy of Roy Haynes is a collaboration. This time, it was Shaw who had the scheduling conflict, and fortunately Strickland was available. Sullivan had returned to active duty, so now it was a reunion of the original Fountain of Youth. And they made the most of it, four sets over two nights with a mix of old favorites and newer additions to their repertoire. And of course the commentary, banter, spontaneity and good humor of 84-year-old Roy Haynes, himself a veritable Fountain of Youth. They started out the weekend with a fiery reading of “Autumn Leaves,” initially disguised by Sullivan’s bass vamp, leading into Strickland’s elegantly swinging melody, subsequent solo and prolonged cadenza. Always one of my favorites from this band, Pat Metheny’s “James” was volcanic, bringing Roy out from behind the kit to brag about his protégés and off a solo spotlight on Bejerano, whose “Easy to Remember” will indeed be hard to forget, particularly how he turned postbop to stride and back as if that had been the composer’s intent all along. Marcus Strickland closed the set with an impromptu fling at a Maceo Parker riff. An equally spontaneous drum solo highlighted the closing set Saturday night, along with a smoldering treatment of “My Heart Belongs to Daddy,” featuring Strickland on soprano, Bejerano’s full deconstruction, Sullivan’s slinky vamp, and busy accents from the leader, who ultimately pulled Strickland into a dual to take it out. A few more jokes, a sing-along, and another Roy Haynes weekend wrapped up. The two sets I attended went on for about 90 minutes, including the finale, ending at nearly 1 am. If Roy was tired, he didn’t let on. Maybe I’ll be that perky when I’m 84, but I have a long way to go. The biggest shopping day of the year, the day after Thanksgiving, is dubbed Black Friday. So what do we call the year’s biggest day of local jazz programming? The Blues Saturday? The roster on November 21st might seem normal for a weekend in Manhattan where audiences are pulled from millions, but this is hardly normal for the Twin Cities where our potential audience is much smaller. While it might not be a boon to spread out the audience across so many venues, this weekend serves up a great candy store of choices. If you focus on logistics, you can make at least three or four gigs on Saturday without exhausting your options for Friday and Sunday. Of course, you might just be exhausted. I highly recommend Roy Haynes and the Fountain of Youth for Friday night (11/20) at the Artists Quarter—if you go Friday night, it might open more options on Saturday, while you can still catch a second dose via the second night late set. Or just forget the dilemma and sign on for all four sets this weekend. 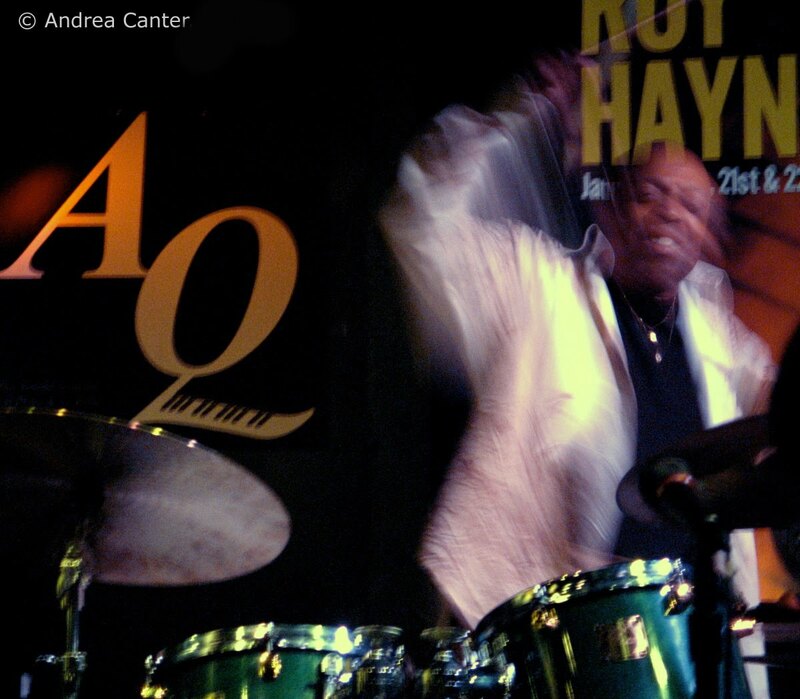 There is no jazz musician still active today with a resume like Roy Haynes. At 84, he can look back on a career with the likes of Louis Armstrong, John Coltrane, Miles Davis, and Dizzy Gillespie; yet he also still looks ahead to his continuing tour with young lions like Martin Bejerano, John Sullivan, Jaleel Shaw and Marcus Strickland. Minus Shaw, it’s the original Fountain of Youth Band that will be erupting on stage at the AQ (11/20-21), two ticketed sets per night. 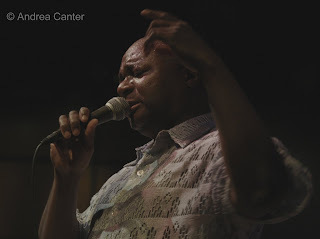 Haynes was most recently in the Twin Cities at the Dakota and Ted Mann Auditorium, but his usual area stomping grounds is the AQ where he recorded live his acclaimed Dreyfus release, Where As, in 2006. It’s a high entry fee for the AQ ($30/$25) but one of the cheapest tickets you’ll find for this legend. Reserve online at http://www.artistsquarter.com/. If you want to stick to Minneapolis Friday night, might check out the new venue in the old Jitters space below the old Times space at 201 E. Hennepin. Top level Ginger Hop is hosting live music as well, but in the lower level Honey, you can catch some of the same musicians who have been churning out experimental vibes at Café Maude: On 11/20, that’s Park Evans, Chris Bates and Joey Van Phillips. Debbie Duncan will sparkle at the Dakota and the Benny Weinbeck Trio has its weekly gig at the new D’Amico Kitchen at the Chambers Hotel. But make it an early night, November 21st will be a long one! For some details, see my posting on Jazz Police (“Saturday Night Live”) at http://www.jazzpolice.com/content/view/8696/115/. Big events, all recommended, include Jazz @ St. Barney’s series concert (in Plymouth at St. Barnabus Lutheran Church) with songbird Maud Hixson and swinging pianist Rick Carlson at 7 pm; the JazzMN Big Band concert in Hopkins featuring “Three Tenors”—local top guns Pete Whitman, Dave Karr and Dale Mendenhall at 7:30 pm; Northrop Jazz Series’ concert at the Walker Art Center with the Dafnis Preito Sextet (not only Cuban drummer Preito, but a great band including trumpeter Ralph Alessi) at 8 pm. Soul singer Otis Clay will be at the Dakota at 8 pm; and around the corner at Hell’s Kitchen, the Vital Organ trio (Tanner Taylor, Zacc Harris, Pete Hennig) will celebrate their CD release at 8 pm. 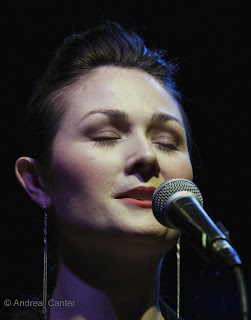 Earlier in the day, Nancy Harms holds her second CD release party of the week, this one an afternoon gig at the Jungle Theater with the Twin Cities Hot Club and crooner Arne Fogel (2-4 pm), and Maxine Souse' (aka Maryann Sullivan) sings at the Sage Wine Bar in Mendota Heights from 6-9 pm. So you can enjoy some great vocals as a warm-up to whatever you do later. And later, there’s some East European folk music translated into modern vibes at Café Maude with the Eisner Klezmorim (9 pm- midnight); the late set with Roy Haynes at the AQ at 10:30; and a CD celebration with edgy brassmen Ingo Bethke, Late at the Dakota, 11:30 pm-2:00 am. For Prairie Home Companion fans, note the appearance of brash and jazzy Nellie McKay at the live broadcast from the State Theater at 5 pm. Forgive me for whatever I have missed here, there’s just no excuse to stay home Saturday night. Cap off the weekend on Sunday (11/22) with brunch at Crave in St. Louis Park featuring Charmin Michelle and Rick Carlson; and then for a sonic dessert, hip and sassy Nichola Miller is recording live at the Artists Quarter with Creation Audio’s Steve Weise and a band with Rick Carlson, Keith Boyles, Nathan Norman and Dave Karr, starting at 7 pm. Coming soon! Two more nights with Pat Mallinger at the AQ (11/27-28); Jane Monheit at the Dakota (11/30-12/1); Dakota Combo annual gig at the Dakota (12/5); Laura Caviani’s Holiday Show at the AQ (12/13); Atlantis Quartet CD Release at the AQ (12/18-19); Birdland’s 60th Anniversary Tribute with Debbie Duncan, Lee Engele and Bruce Henry at the Bloomington Center for the Arts (12/20); the Bad Plus at the Dakota (12/25-27). Musicians that typically generate classical, if also ultra modern fare, are finding their way into jazz clubs, jazz charts, jazz sensibilities. 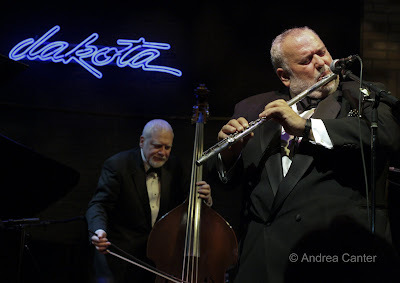 Two recent shows at the Dakota Jazz Club, and a small faculty recital a few hundred miles to the south, are good examples of genre-bending from a classical foundation. 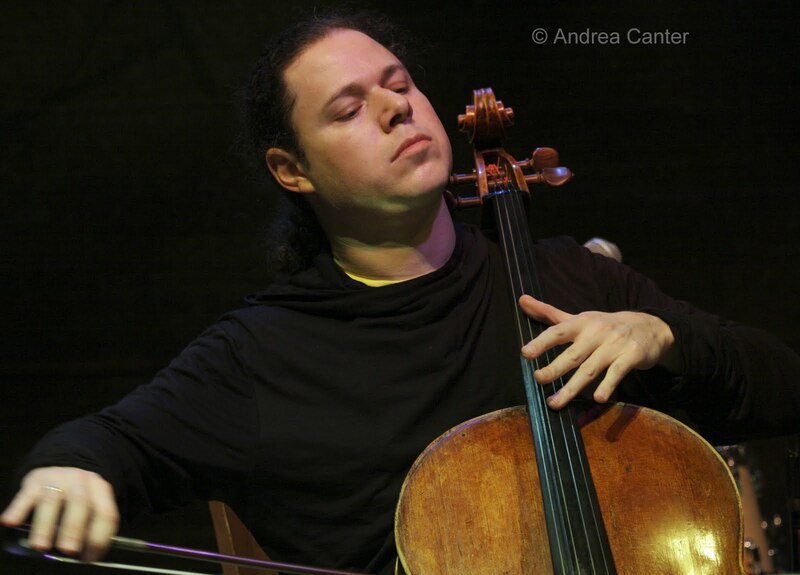 I already said a bit about cellist Matt Haimovitz (October 28th) a couple weeks ago, but more seems warranted. He has appeared here as a solo act several times. Classically trained and acclaimed, on any given night his set list might include a Bach Prelude and a Jimi Hendrix tune. His current tour features avant garde singer/songwriter/keyboardist/laptop artist Du Yun who has been performing electronic cabaret. 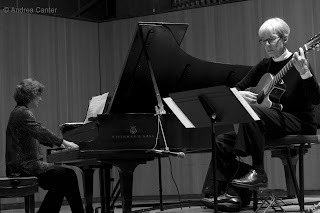 The duo performed material from their recent release, Figment to an audience that might have been expecting a more traditional classical recital or perhaps a more punk rock rebellion. Basically there was not that much of either. What we did get was a 90-minute suite that moved from 21st century experimental music particularly engaging via Haimovitz’ long solos—melodic with harsh fillers of percussive bowing and jagged plucking—to Du Yun’s oddly voiced solo piano, overlaid with heavy reverberations and electronic loops accompanied by eerie vocalizations, even an autoharp. It was an evening of mysterious pitches, haunting bass tones, visually intriguing slapstick antics that put the cello into another universe. Perhaps it was the confluence of John Cage and Cecil Taylor. The Turtle Island String Quartet (November 12th) is more often heard in concert halls than small jazz clubs, yet their music seems equally at home in a jazz environment as in a classical venue. Bringing improvisation and an amalgam of styles to a classical music foundation, TISQ is the ultimate cross-over ensemble, most recently exploring the works of John Coltrane, which they brought to the Dakota. But even before they got to the much anticipated “Love Supreme,” they took on Chick Corea, John McLaughlin, and Trane himself with “My Favorite Things,” “Moment’s Notice,” and the exceptionally lovely “Naima,” the four strings conjuring at least three horns. Coltrane seemed more akin to Schoenberg than Coleman. But the main event was Coltrane’s masterpiece, now TISQ’s centerpiece, four movements starting with their interpretation of Coltrane’s full solo, the middle movements more classical in form and sound, the finale a prayer. Although lacking piano and drums, the TSIQ nevertheless conjures more voices than the Coltrane Quartet, as each stringed instrument is capable of multiple tones, creating thicker harmonies. 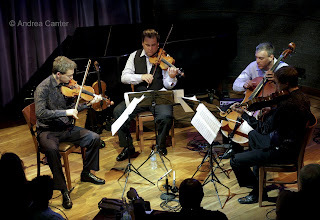 But what string quartet sways with the music in time, taps its feet, turns its fiddles into percussion tools? 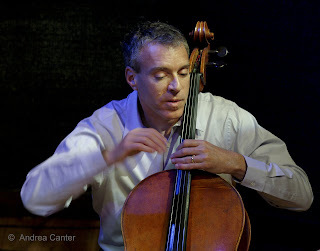 Cellist Mark Summers would have been a good alter ego for Jimmy Garrison. Summers, the most animated of the foursome, was given a solo spotlight, playing his own “Julio.” He bowed, he plucked, he slapped and danced through what resembled a traditional folk melody, and we forgot it was a cello, not an upright bass. TSIQ closed with Stanley Clarke’s Coltrane tribute, “For John,” adding a lick of “The Girl From Ipanema.” Even the great classicists were not above a few quotes! A few nights later I enjoyed a faculty recital at the University of Iowa. It was simply titled “Chamber Music” and was led by Volkan Orhon, faculty bassist who has some jazz chops in his arsenal. The evening featured a varied program dipping back to the 17th century and reaching ahead to the present day, with varying combinations of bass, violin, viola, 2 bassoons, oboe, harpsichord, and piano. Two works of note in the context of blended genres: “Duo for Viola and Double Bass” by Tom Knific, himself a bassist and director of jazz studies at Western Michigan University. The second movement in particular was a tapestry of the world of music from Baroque to post bop with flashes of gypsy swing and Spanish folk melodies, aptly titled “The Event.” The other surprise was a world premiere of sorts, a work by Mario Ulloa based on Mozart’s “Alla Turca” for bass and two bassoons. Titled “Um Turco no Brasil,” it crossed cultural as well as musical boundaries, a Middle East Meets Tropics frenzy. The world on a string. And two bassoons to go. If I were in town this weekend, I might have some dilemmas as to my preferred jazz events. So I guess I will just envy whatever decisions you make! Big gigs on both sides of the river: At the Dakota, Debbie Duncan will carry on for a very lucky Friday the 13th, followed on Saturday night by the always exhilarating Ginger Commodore Quartet, augmented by the smooth and suave Dennis Spears. That’s a lot of soulful voices in one weekend on one stage! For a very different, equally exciting sound, the Pete Whitman X-Tet will blow hot and cool at the Artists Quarter. Pete and the gang typically get a weeknight gig every month, but the weekend shows are extra special. It’s about as big a band as you can squeeze into the AQ, too! Regardless of your starting point, make the Dakota your end point on Saturday, with the Bryan Nichols Trio doing Late Night duties from 11:30 pm – 2 am. Nothing will keep you as alert and intrigued as Bryan and pals. Except maybe Ellen Lease and Pat Moriarty! Possibly the most “out there” jazz couple in town, Ellen on piano and Pat on sax normally head up the Ellen Lease/Pat Moriarty Quintet, one of the region’s finest avant garde ensembles. But on Saturday (11/14), it’s just Ellen and Pat in the first of their Tonight at Noon: Jazz at Studio Z series in downtown St. Paul. More to come later this winter and spring, including a new incarnation of the Quintet minus Kelly Rossum. There’s more for the weekend of course: For some great free music, check out the Holiday Open House at the Galleria in Edina, and particularly stop by the courtyard outside the Good Earth for a dose of Mary Louise Knutson, with Jeff Bailey (11/13 at 5 pm) or with Gordy Johnson (11/14 at 11 am) or with Chris Bates (11/15, noon). Can’t beat that! (Mary Louise and Debbie Duncan team up weekly on Tuesdays at Camp in St. Paul!) The over-the-edge Enormous Quartet improvises at Café Maude (11/13), other Friday the 13th options—more inclined to soothe nerves-- include Maud Hixson and Rick Carlson at the Redstone Grill in Minnetonka (11/13), Jo Ann Funk and Jeff Brueske at the St. Paul Hotel Lobby Bar, and the Benny Weinbeck Trio at D’Amico Kitchen in the Chambers Hotel in downtown Minneapolis. On the north end, relaxation is on the set list with Arne Fogel and Kristin Sponcia at Ingredients Café Saturday night (11/14). During the week, you can get a big taste of New Orleans without leaving Minneapolis, as clarinetist Evan Christopher returns to the Dakota (11/17) in the company of fellow Crescent City pianist Henry Butler. Wonder if Jack Riebel will be offering some gumbo and pecan pie? If you want to live dangerously, check the return of Volcano Insurance at the Kitty Kat Club (11/17)! 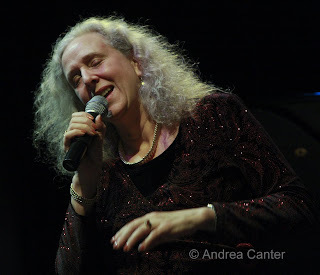 If swing’s the thing, Anita O’Day will be celebrated through the musical charms of Lucia Newell, at the Artists Quarter with the Phil Aaron Trio (11/18). Another local vocalist, Nancy Harms, celebrates the release of her debut CD, In the Indigo, with her quartet at the Dakota (11/19) and again over the following weekend at the Jungle Theater (11/21). This might be Nancy’s first recording, but it’s an effort worthy of a veteran, filled with original arrangements, lyrics, and very personal interpretations of familiar and less familiar works. On the west end, Rhonda Laurie and Sidewalk Café return to Spasso (11/19), Richfield as usual boasts Charmin Michelle and Denny Malmberg at Fireside Pizza Mondays and Wednesdays, while the Dave Karr Quartet bops away at the AQ (11/19). All this might be good training for the next weekend, which will truly challenge decision-making skills: Roy Haynes and the Fountain of Youth at the AQ (11/20-21); the JazzMN Big Band on 11/21with its Three Tenors (Pete Whitman, Dave Karr, Dale Mendenhall); the Dafnis Preito Sextet at Walker (11/21); Maud Hixson at Jazz@St. Barney’s in Plymouth (11/21); and Nichola Miller’s live CD recording session at the AQ (11/22). That is of course just one weekend. We seem to be having our October weather this weekend, so get out and enjoy it, but save enough energy for some jazzy evenings. Lucia Newell and the Laura Caviani Trio should garner plenty of attention from the noisy crowd at Crave in the Galleria tonight (11/6). Maybe Lucia will include some Anita O’Day tunes as a teaser for her November 18th tribute show at the AQ? If you really want to hear the music at Crave, come late, after 10 pm, and find a table as close to the “stage” as possible. Bruce Henry, whom I would rate as one of the best male singers out there (and I mean out there in the bigger world), returns to the Dakota for two nights (11/6-7) with his always hip band (Peter Schimke, Kevin Washington, Darryl Boudreaux, Peter Vricks, and Chris Bates filling in for Jay Young, who is across town at the AQ). It will be smooth, passionate and uplifting. And yes, Jay Young is leading a gig at the AQ this weekend, a tribute to Motown heroes, Michael Jackson and Stevie Wonder. This funky bassist is overdue for his own show. Late Night at the Dakota is always worth checking out, no matter where you start your evening. Off the Map with Bryan Nichols, Brandon Wozniak and Jay Epstein takes the stage Friday night (11/6). Can’t find three more exciting improvisers! Sunday (11/8) brings some interesting contrasts, but that means everyone should find something that appeals: Charmin Michelle and Rick Carlson are perfect company for brunch at the new Crave in St. Louis Park’s West End. Later, at the Dakota, John Jorgenson brings his hot club band back after a highly regarded debut earlier this year. Across the river at the AQ, it’s Monk in Motian, a sextet celebration of the great compositions of Thelonious Monk as interpreted by drum legend Paul Motian and his Electric Bebop Band. And of course Zacc Harris, Park Evans, Brandon Wozniak, Scott Fultz, Matt Peterson and Pete Hennig have tricks of their own to share. This gig is sponsored by the Twin Cities Jazz Society, and introduces the St. Cloud All Star Jazz Band to warm up the stage at 5 pm with a free set. This is a band of middle and high school musicians, directed tonight by drummer Steve Jennings. Free jazz fans (and eternally curious listeners) will find plenty to perk up your ears at Studio Z in downtown St. Paul when Trio Raro -- Milo Fine, Andrew Raffo Dewar, Davu Seru—perform. 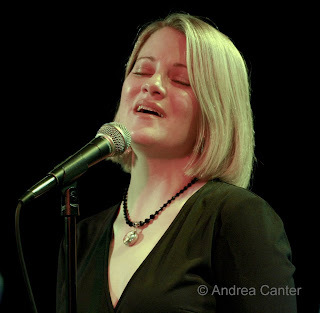 Connie Evingson is not only a superb vocalist but she never fails to bring a terrific band to her shows. Monday night at the Dakota (11/9), she’ll be in the stellar company of Phil Aaron, Gordy Johnson, Phil Hey and Dave Karr. Try to find a better deal for $5! Charmin Michelle and Denny Malmberg will be in their usual slot at Fireside Pizza, Monday and Wednesday night, and the always avant Clown Lounge in St Paul features the Chris Thomson Quartet. Nostalgia reigns at the Dakota Tuesday and Wednesday nights (11/10-11) with Herb Alpert (Tijuana Brass) and wife Lani Hall (Sergio Mendes), while the Tuesday Night Band celebrates the B-3 organ in their usual, long-standing weekly gig at the AQ... on Tuesday, of course. A few blocks away, Debbie Duncan and Mary Louise Knutson add class and finesse to Camp Bar in their Tuesday night sets. Wednesday (11/11) offers further diversity with How Birds Work at the AQ, the Wolverines with Arne Fogel at Hell’s Kitchen, and Maud Hixson swinging with the Twin Cities Hot Club in northeast Minneapolis at Erte. Close the week with some tough choices on Thursday (11/12), as the ever-exciting Phil Hey Quartet takes over at the AQ and the world-renowned Turtle Island String Quartet makes a rare club appearance at the Dakota. Bringing improvisation and an amalgam of styles to a classical music foundation, TISQ is the ultimate cross-over ensemble, most recently exploring the works of John Coltrane. Tonight they bring to the Dakota their “Love Supreme” project. Maud Hixson and Rick Carlson visit Minnetonka with two nights at the Redstone Grill (11/12-23). 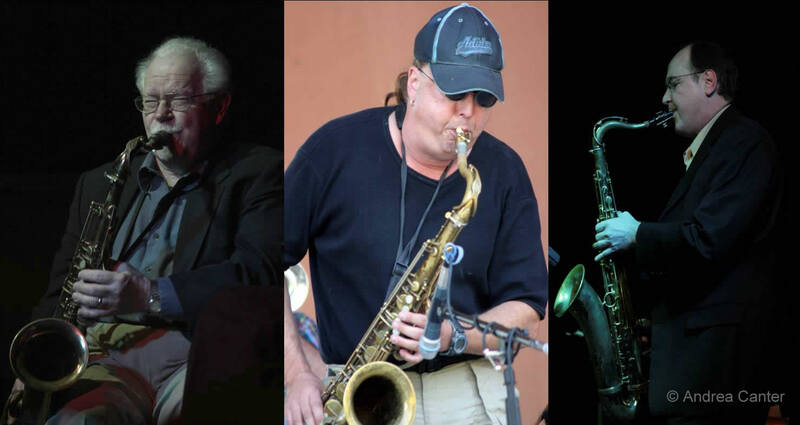 Pete Whitman’s X-Tet has a weekend at the AQ (11/13-14); the Freedom Jazz Festival sponsors a day of music and art at the Capri Theater (11/14); Lucia Newell salutes Anita O’Day at the AQ (11/18), and Nancy Harms celebrates her debut CD at the Dakota (11/19) and Jungle Theater (11/21)—and it’s one helluva debut. Then there’s the following weekend which simply explodes with jazz, with Roy Haynes’ Fountain of Youth at the AQ (11/20-21), “Three Tenors” with the JazzMN Big Band (Whitman, Karr and Mendenhall on 11/21); drummer Dafnis Preito at the Walker Art Center (11/21) and Maud Hixson and Rick Carlson at Jazz@St. Barneys, also 11/21. Nichola Miller holds a live recording session to cap that weekend at the AQ (11/22). Rest up. I seem to have a habit of catching jazz legends at the end of their careers –Doc Cheatham, Jay McShann, Ray Brown, Oscar Peterson. Brown was ageless, and fortunately I had seen OP several times over the past two decades. His last performance at Orchestra Hall, about two years before his passing, was more a document of his failing technique than his enduring art. 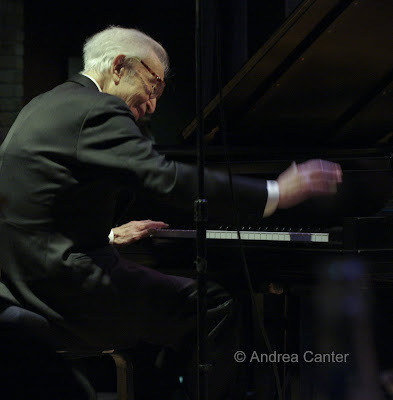 I have now seen Dave Brubeck four times in the past two years in settings ranging from Orchestra Hall to a small concert hall in Santa Rosa to the outdoor amphitheater of the Detroit Jazz Festival... and now this week in the small club space of the Dakota Jazz Club in downtown Minneapolis. 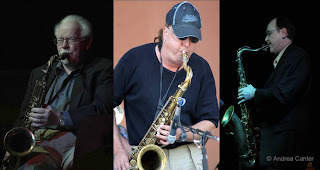 A month shy of 89, there is no question that even Dave Brubeck has lost some speed and agility, and his arrangements today defer more to his much younger (though still AARP-eligible) quartet cohorts-- Bobby Militello on alto sax and flute, Michael Moore on bass and Randy Jones on drums. Brubeck was greeted at the outset with a standing ovation, the audience reverent in the presence of one who has contributed so much for so long. That ovation was repeated 100 minutes later, honoring not only his career, but the continuing vitality of the music and its maker. I wish I had seen the Dave Brubeck Quartet in the late 50s and 60s. Fortunately that era is well preserved on record. Yet in the 21st century, Brubeck and company still have a lot to say. Dave Brubeck will be inducted into the Kennedy Center Honors on his 89th birthday next month. See full review soon on Jazz Police and JazzINK. Somewhere There's Music: Sometimes There's a Lot! The weather was unusually wet and cold, the colors rather blah, but the music was hot and bright at every turn. 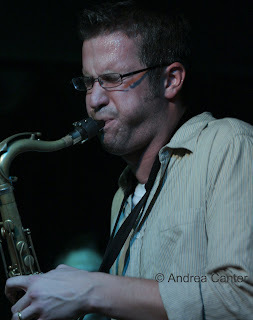 Eric Alexander (10/24) played two nights at the Artists Quarter, and his beefy tenor sax has never sounded better. With his mom in the audience, perhaps he was just that much more inspired, and his local cohorts (Chris Lomheim, Tom Lewis and Kenny Horst) were perfect foils from the first notes of “The Night Has a Thousand Eyes” to the last blistering chorus of “Lover.” Generally Eric gives us familiar tunes, even what normally might be worn out standard like “Smoke Gets in Your Eyes,” but he makes us fall in love with the melody as if for the first time. Joan Griffith/Laura Caviani (10/25). Free Brazilian and related music on a gray Sunday afternoon is at least as good as light therapy to elevate mood. Particularly if the music comes from Joan Griffith and Laura Caviani. In the acoustic gem of Janet Wallace Auditorium on the Macalester College campus, Joan and Laura revisited compositions from their SambaNova! recording and related works, showcasing some of the legendary Brazilian writers as well as Joan’s own originals incorporating Brazilian traditions. Between their two sets, Joan gathered three of her students from the St. Thomas Guitar Ensemble, featuring each young man in turn. St. Paul might pride itself in its Irish heritage but on this afternoon, the festivals and villages of Brazil were a greater presence than fields of heather. Evan Christopher (10/25) was the special guest at the annual A-Train Party at the Dakota, and his flight from New Orleans was made all the more worthwhile with support from Tanner Taylor, Reuben Ristrom, Gary Raynor and Joe Pulice. Was this quintet really together for the first time? Each of the locals has a reputation for unreserved swing and that fit perfectly with Christopher’s energetic clarinet. He traded it briefly (and magnificently) for soprano sax on “What Is This Thing Called Love?” and closed the set with the unfamiliar (to me) “For Juanita Brooks.” This was Evan’s first gig at the Dakota and it won’t be his last--- Lowell Pickett immediately booked him for an open date in mid-November, with fellow New Orleanian Henry Butler on piano. 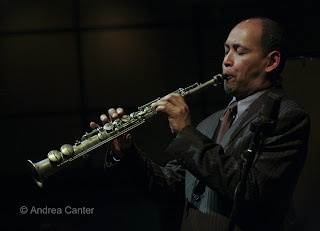 All I know is that there isn’t enough clarinet in modern jazz, and Evan Christopher makes you wonder why. Don Byron and Anat Cohen aside, the instrument seems far more versatile than just trad and Dixieland. Maybe Evan can help change that. Sophie Milman (10/27) has now appeared three times in two years at the Dakota, and each time the audience is larger and the applause more spontaneous. And each time, Sophie seems to have taken another leap in confidence. Playing at the club she described as “my favorite place in the U.S.,” the hottest commodity in Canada since Diana Krall enthralled a nearly full club and dining room with songs from her highly regarded 2009 release, Take Love Easy, her slightly dusky vibrato and right-on pitch gliding as smoothly through Joni Mitchell and Bruce Springsteen as Rogers and Hammerstein. Earlier this fall, Sophie had canceled a chunk of her American tour due to voice strain (which she candidly discussed on her website), but there was no trace of any negative effects in her second-night opening set. And as usual, her band was supportive and thoroughly capable of carrying the music on their own, led by pianist/composer/arranger Paul Shrofel. Diego Rivera, whom I saw recently in Detroit with several large ensembles, blew bold solos on tenor sax, and it was great to see our own Gordy Johnson on bass. Matt Haimovitz & Du Yun (10/28). 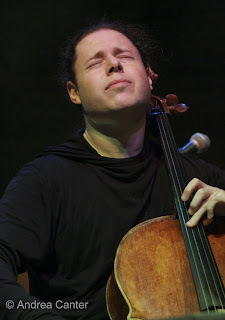 I grew up on classical music and the chance to see a solo cello in the environs of a jazz club was irresistible when Matt Haimovitz first came to the Dakota a few years ago. This visit was over the edge, even for Matt, as he has teamed up with Japanese pianist/electronics artist Du Yun on a suite of simply intriguingly odd music, recorded recently as Figment. Spoken word—provocative and at times way off quadrant lyrics—invaded the music on several segments; long solo passages on cello sustained Haimovitz’s reputation for making dissonance beautiful; Du Yun’s unique voicings on acoustic piano and her laptop-directed electronics often countered the beauty but if anything, added to the mystery and forced careful attention. The single set was played (for nearly 90 minutes) without a real pause, like a classical suite, and with a pre-set program which was provided to the audience. It’s possible some was improvised, more likely not. It was as visually arresting as aurally spellbinding. Joel Vanderheyden and Koplant No (10/28). Thirty minutes after the last notes of Figment, I found myself across the river in St. Paul, at the Artists Quarter for the local debut of Koplant No, a very young (it seemed) quintet led by native Twin Citian and now Iowa resident Joel Vanderheyden. Joel finished a doctorate in classical saxophone at the University of Iowa in Iowa City and has stayed on, leading Koplant No (he says the name comes from a bumper sticker, “Coal Plants – No!”) and recording his first CD (Complete Life) with the quintet and a few additions including veteran Iowa guitarist Steve Grismore. Koplant No plays all original music, much of it contributed by Vanderheyden, much of it integrating acoustic and electronic elements (and some vocalization) into generally melodic wholes. There’s injections of humor everywhere, particularly in the titles that are somewhat reminiscent of Bad Plus monikers, “Stubby McGhee is Somewhat Less Than Confrontational” being my favorite title. Often the music has an ECM ambience but there’s also that Midwest down-home comfort feel in the midst of the loops and pedals and tonal eccentricities. Koplant No will be on the main stage of the Iowa City Jazz Festival next summer. I know there was a lot of good music around town this weekend, but after the whirlwind of the preceding week, I observed a few moments of silence. I wanted my ears ready for Dave Brubeck!